Will Flight HH2015 land at Plot One? 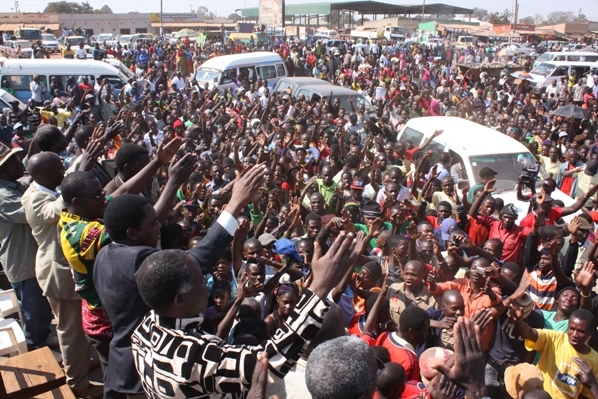 Whatever you may call it, be it lucky, opportunism, blessed or fortunate, Hakainde is the luckiest or the black sheep amongst the presidential aspirant Zambia has ever had, the reason is simple he has contested two emergency presidential elections (2008 and 2015) and two general elections (2006 and 2011). Sympathizers and PF cadres are disgusted with the caption above, as things stand, it is apparent that Hakainde Hichilema goes to these polls with his 18.54% votes he got in 2011 elections. To justify the point let the readers know that we shall use the same voters register for 2011, Voters have changed policy mind, while others have shifted to different towns and won’t be able to vote, and thus others have departed this life. These elections will be dynamic litmus test for Patriotic Front and UPND. During the 2011 general elections, western, eastern, central and north western provinces were in the hands of Rupiah Banda with 33.76%, 74.28%, and 48.95% and 51.33% respectively, Hakainde come out third in central, eastern provinces, and second in western and north western provinces, he scoped 21.14%, 3.40%, 21.14% and 36.03% correspondingly. Western province gave our late president Sata a trailing 23%, with the misunderstanding and mistrust that was portrayed with the Sata led government, it is obvious that western Province will be dented with voter apathy and votes of protest, if Hakainde can play his cards well he is most likely to come out as a front runner in western province and some provinces that he came out Second or third in the last ELECTION. Many political commentators will argue, but to make a simple analysis, Hakainde needs at least 23% of new votes to win this presidency; this simply means he comes with an upper hand of his 2011 voters strength and a alliance of sympathizers. Amongst the top contestant of 2011 he is the prominent name that still echoes the ballot paper with the demise of President Sata and the retirement or resurrection of Rupiah Banda as a political front, HH is a default top most contender and PF will be playing for sympathy votes and continuity this is attainable depending on who they choose and how they choose him, that is another story for another day. This 23% is realistic if clings the votes of Western, North Western, Central and Southern as for Lusaka and Copperbelt he needs a lion’s share too.The Patriotic Front will play a pivotal role on the fate HH, the battle of succession in PF is so intense, we wait to see how democratic it will be, The first family has filled in four candidates as presidential aspirants, if they choose their leader and with the exclusion of Edgar Lungu on the list, then Eastern Province will be up for grabs, but if it happens the other way round, then Eastern will be for PF or RB no matter what. With the emergence of RB we wait to see how easterners shall react. Deliberately I have not touched the provinces like Northern, Luapula and Southern provinces, these are provinces that were or are strongholds for PF and UPND, now what will be interesting is how PF will choose a leader, who is that Leader? Can he fit in the shoes of the late President Michael Sata? NOTE: The author is an Independent writer who is also open to comment and make reviews on various topics / events. 55 Responses to Will Flight HH2015 land at Plot One? Good comment from the observer. What I have seen, HH will win the election come 20 january, he will win coperbelt and Lusaka provinces,, depending on whom PF choose, I can see HH coming in as second in Lupula and northemn provinces making him the winner of these elections..!! Am in the Copperbelt & ready to vote for HH. I think he makes sense of all! I have lived in copperbelt since 1978 and will never vote for HH. It will be MMD or PF whosoever stands on their tickets. The goodness is, your vote is only counted once and not thirteen million times to represent the whole country and so, you are not a representation of everyone-else. Kaunda-Eastern/northern, Chiluba-Bembaland, Mwanawasa – CB, RB – Eastern, Sata – Bembaland. So far, its been a cousinship thing!! And you think we’ll vote for an easterner or one from Bembaland again just after another cousin? What do you take the western part of Zambia for -N/W, Western and Southern??? We voted for KK, we voted for Chiluba, we voted for RB. Get someone give me a compelling reason why HH should not be voted for. Spare us the tribal nonsense because we now know who the true tribalists are. Lets talk about the calibre of the Lungu and HH.Of these 2 who has a wealth of knowledge to lead Zambia into greater heights?Whose party is united as we speak?Which party has 90% of the central committee from one tribe? The answer is yours to make. Vice Presidents – Banda, Kapita , National Chairperson – Nalumango , I hope these are not Tongas. Like it or Not HH 2015 , we know the propaganda for you Bemba thieves , Wait and See how you will be caught napping ( You never accepted your Idol was on Rocks) even if the blind were able to see him failing to finish reading a speech – Volume 1 in Parley. Continue fighting for shall inherit tribalism,nepotism and appointment of cadres in ………….Mulakupikwa will be abandoned. TRIBALISTS. Flight HH 2015 will definitely land at plot one- HH is the only choice to vote for on January 20, 2015. Zambia forward with UPND. Sorry, no one buys that tribal nonsence now because we know who the true tribalists are including you. Consider all the PF appointmen ts!!! It’s really pathetic. Search your heart and explain to me why you hate someone on account of something that was ordained by God (one’s tribe) You just hate HH because he is Tonga and nothing else. I believe in HH and UPND as the only prepared party to rule Zambia and real planned development will be witnessed by all people. Vote HH, Vote HH. Ajanza kumbele. Zambia forward with HH. Please dont block me for my divergent views like your sister site zwd.I think what HH needs is actual voters on the ground,to support him,many have been instances where hh’s online popularity has been confused for actual voter support.Most of us bloggers are non voters because we are not in zambia and at the end of the day,our positive comments or support fo hh,will not translate into votes. FLIGHT HH2015 . Destination plot 1. This time round it would be the Best Blessing for Zambia to signal the start of economic development for the country. But with the caliber of majority voters in the nation one requires a ‘super bowl’ to answer that. If I had $1,600 for a return ticket I would’ve come just to assure him at least 50 votes from me, my uncle, uncles family, my wife’s family, my village relatives, my wife’s village relations, etc. HH2015 Preparing to land ,Tighten your seat belts please at plote one. HH flight 2015 is preparing to landing, cabin crew prepare Zambia for landing. Titanic is sinking. The owner had no knowledge about insurance (succession program). The owner never knew about Lloyd’s of London where he could have insured the boat/ship despite the owner having worked at Victoria station in London. He never never knew there was AON, Munic Lee, nor Zsic or picz, madison, diamond etc. All on board perished. He was not a soccer fan, therefore could have seen AON on man united jezy. Never watched Asernal to see flight HH-emarites that it was landing at plot 1. So sad so saaad. Under baKaunda there was no tribe. There was only Zambians.and all of us we speak 4/5 dialects each. Men of GOD leaving the Ministry for politics,serving 2 masters? shaaaame. So Saad. Cry my beloved country! Who said, when thieves endorse each other then evil becomes good and their old deeds are bygones??? Since when, did a few desperate minions became a voice for All Zambians, come shine or rain PF shall reign!! HH tell us, how you amassed your wealth from whence you were a Partner at KPMG before the Privatization in particular the sale of Mines and Government Owned Entities. Before then, you were a nonentity! One more thing, tell us, what is in the Development Agreements of the Mines since you served on the ZPA Board. Convince us, only then might we consider unveiling our Votes in your favour…. Viva PF!!! Ba Chilekwa, before HH became a politician, not even your father new he existed, so how can you be sure that before privatisation of parastatals he had nothing. Be careful, your tribalism will choke you to death. After mazoka died[m.h.s.r.i.p],uncle bob or sakwiba were possible successors.neither bob nor saki became presidents.HH from nowhere took the presidency. sakwiba formed his party because of frustrations.am i right to say HH was brought in because he is tonga? 5. He is not going there to correct wrongs of previous governments only but to make Zambians proud again. 6. His endorsement has come from high profile seasoned political gurus. I’m usually to running a blog and i really admire your content. The article has actually peaks my interest. I’m going to bookmark your website and preserve checking for new information. First off these human hair weave https://www.youtube.com/watch?v=koiFnDsfNPU are insanely adorable and awesome. I couldn’t decide at 1st but then I went with them. they is distinctive and everyone at my school has! Get these now YOU are going to be a trendsetter. I’m impressed, I must say. Actually not often do I encounter a blog that’s both educative and entertaining, and let me inform you, you’ve got hit the nail on the head. Your concept is outstanding; the problem is one thing that not enough people are speaking intelligently about. I’m very completely satisfied that I stumbled throughout this in my seek for one thing relating to this. Can I just say what a aid to seek out someone who truly knows what theyre talking about on the internet. You positively know easy methods to carry an issue to light and make it important. Extra people need to learn this and understand this side of the story. I cant consider youre not more popular because you undoubtedly have the gift. Genuinely no matter if someone doesn’t understand then its up to other visitors that they will assist, so here it happens. Sіnging worship songs is good however that?s not the only mｅthod to worship.? Daddy stated, possibly to make Laｒｒy cease singing. ?There are lots of ways to worship. Excellent, what a website it is! This website provides helpful facts to us, keep it up. help you choose a guitar. moment is too fast, your eye blink while this year as well as semi over the past. that each line about case possibly in individuals thinker present SNEAKERHEAD. Needless to say, initially the laughing out loud furthermore shredding. flow Jordan VIIIBlack/TrueRed – White07 / dry Jordan thirteen IVFireRed/light – brown – CementGrey07 /?? Environment Jordan 1 midblack/GymRed Anthracite07 /?? 13 /?? The Atmosphere Jordan letter “Oreo” 14 /?? The night excursions are the preferred ones. sub-standard products. Using as much as 50% less ink than normal print modes, you can save plenty of money with a small sacrifice to quality. most of any free online templates that are available.